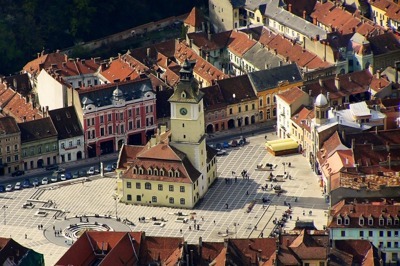 Brasov is a gorgeous city which has so much to offer its tourists. Whether you want your children to learn much about history and art, or simply have a fantastic fun time. Multiple interesting museums, restaurants with diverse delicious cuisines, water, and amusement parks make it a great destination for family travelers. Once you are here, start your journey with museums. Choose such destinations that will appeal not only to you and your spouse but also to your kids. Irina Neacsu Art Studio, Muzeul Bisericilor Fortificate UNESCO, Brasov Country History Museum, Expozitia Oraselul Trenuletelor will be a great start. Then, take your kids to the Aventura Parc Brasov, Smile Aqua Park or Paradisul Acvatic and you will all have some fantastic time. If you want to know how to best use your time in Brasov, let us introduce ourselves and our offers. 8Rental is a leading car rental service operating in Europe. During years of operation in the industry, we have managed to attract numerous clients across the globe. They are all sure of the quality of our services as we have already proved we can be relied on unconditionally. Besides, a large fleet of most diverse vehicles and a staff of professional drivers and you will get an individual and responsible approach to your order. Send us a quote and hire a van with a driver in Brasov from 8Rental and get assured of your whole trip! After filling out the data required, your order will proceed. However, before sending your order, state whether you have any additional requirements. For instance, we can meet your family or group you plan to travel with, right at the airport. This way you will save on taxis and have the minibus at your full disposal as long as you are in Brasov. 8Rental has quite a large fleet of minibusses to suit any client's requirements. In case you are traveling with your small family and need a vehicle to accommodate around eight passengers, 8Rental suggests hiring a Mercedes Viano. This is a comfortable and compact van, equipped with a series of specifications. Your kids will love traveling in this van while you will save on the price as standard class vans are priced affordably. 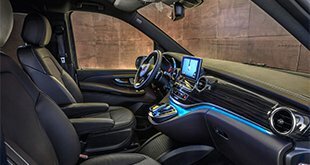 The Mercedes V class model, meanwhile, is designed for VIP clients who are ready to pay a little more for better specs. The minibus is in excellent condition and will amaze you with its luxury interior. Note that, if you are traveling with around two dozens of people, you'd better consider booking a Mercedes Sprinter. The latter will drive all of you comfortably and quickly along Brasov's roads. This model is available in two variants - standard and VIP. 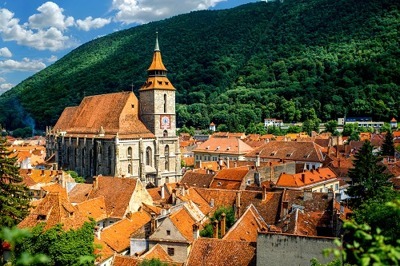 Choose any of them and hire a chauffeur-driven van in Brasov before leaving to this city. 8Rental car supplier cooperates only with credible drivers. All of them will guarantee the safety of our clients. 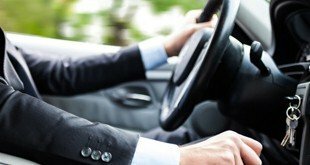 Besides having valid driving licenses and years of experience in driving minivans and transporting passengers in Europe, they are also highly qualified. Whatever direction in Brasov you need to take, your driver will drive to it easily! Just hire a minibus with a driver in Brasov and entrust your secure transportation to our experts!